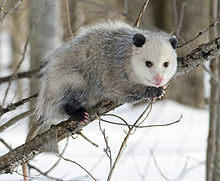 The Virginia opossum (Didelphis virginiana) is the only species of North American marsupial. It is sometimes called a possum, but that refers more correctly to a group of Australian marsupials. An opossum is about the size of a house cat. It has grizzled white and gray fur. Adult opossums weigh about 2-6 kg (4-14 lbs). They live alone, are active at night, and they are good climbers. People can find this opossum in the eastern United States, and along the west coast from British Columbia and to Baja California. They like to live in forests, brushy areas, and farmland. Wikispecies has information on: Didelphis virginiana. Wikimedia Commons has media related to Didelphis virginiana. This page was last changed on 23 May 2016, at 14:32.